For those who have always wanted to go to the annual International Blade Show and Cutlery Fair that is held each year at the Cobb Galleria in Atlanta, this is the weekend for it. The Blade Show starts on Friday, June 6, with an opening at noon and runs through Sunday. Not only does the show bring the world’s knives and bladesmiths to Atlanta, it also brings venders who sell knife-making supplies. These include everything from steels, to belt grinders to exotic handle materials from all over the world. Not only can you buy the materials to use to make your own knives, you can also attend seminars and purchase books and videos to tell you exactly how to do it. My most complete coverage of the show was in 2011 when I did a video and two one-hour long radio episodes of “Hovey’s Outdoor Adventures.” You can listen to the 2011 and 2012 radio shows about the event at WebTalkRadio.net. I have an overview of the shows, including photos of the knives, at my Hovey’s Outdoor Adventures Radio Show Blog at http://www.hoveysoutdooradventures.wordpress.com. The second hour-long show includes a visit to Buck Knives new facility at Post Falls, Idaho, and an interview with CJ Buck. Exciting outdoor demonstrations are always a part of Blade Show events. 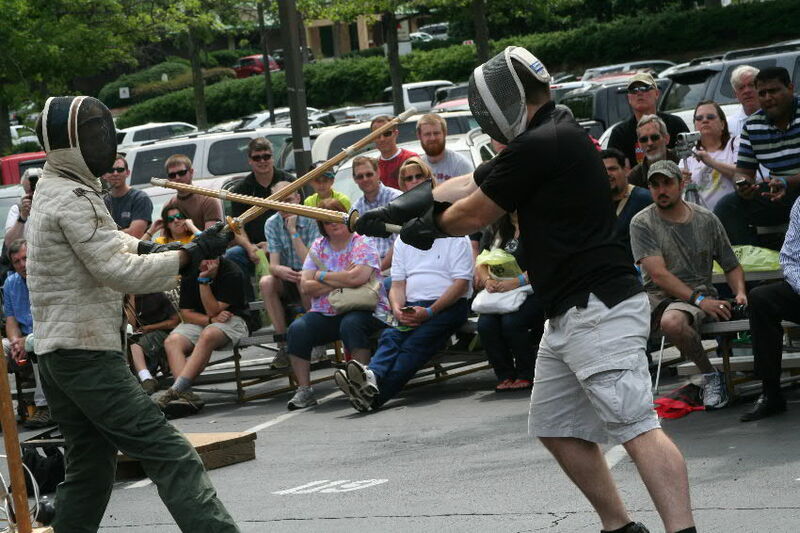 There are also blade-cutting contests, demonstrations, TV personalities, sharpening demonstrations and knives that are thousands of years old at this event. This is a family-friendly event and all are welcome. My personal in knives is about working knives and other edged tools used for hunting, camping, in the business trades and for all-around utility. I write about knives for magazines like Knife World, have had articles in the Knife Annuals published by Krause as well as blog about them. Most commonly when I use knives it is for hunting and cleaning up my yard after storm events. I have several videos on these subjects on YouTube. A Google search for “Hovey storm tree” or “Hovey knife hunt” will find them.